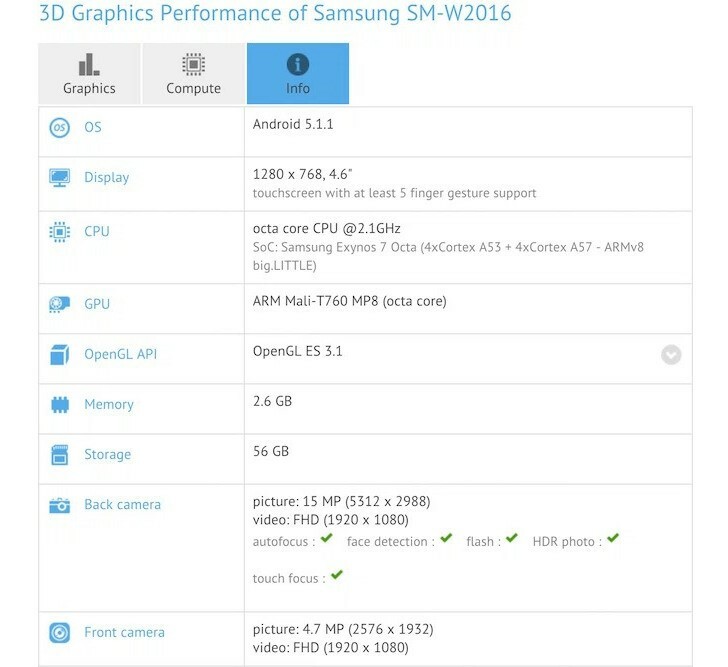 A new Galaxy model - SM-W2016 - was spotted within the GFX database. It is powered by the high-end Exynos 7 Octa chipset with an octa-core processor, Mali-T760MP8 GPU and 3GB of RAM. The internal storage of the W2016 is 64GB and its camera duo is identical with the Galaxy S6 lineup - a 16MP 16:9 main camera and a 5MP front snapper. Note that the benchmark suggests the screen is a 4.6" HD one, but we've seen benchmarks get this wrong quite a few times in the past. The most fresh example is indeed the G9198 model, which leaked in GFXBench with the same 4.6" HD display, but turned out differently. The new model was also spotted recently inside the Zauba listings - it was imported in India for testing on October 6. The listed price is INR 26,725, which translates in roughly €360 before taxes (or about €420 if it were to sell in Europe). Since the W2016 Galaxy was imported in India, there is a good chance it isn't another phone meant for Korea. Unfortunately we have to dismantle the theories about the W2016 being the Galaxy S6 mini. The SM-W2014 is the Korean model number for the original Galaxy Golden flip smartphone, released in Asia over a year ago. The SM-W2015 Galaxy Golden 2 leaked a year ago via TENAA, but we never heard about it again. And now it seems the SM-W2016 is the Galaxy Golden 3 flip smartphone. Apparently Samsung created another niche device, but this time around it features flagship specs. The two displays are most probably of the Super AMOLED kind. looks good hope it functions as well.has it come to kuwait.wil buy one.